Palm Sunday, April 24th, Blessing of Palms & Willows 9:15a.m., Divine Liturgy 9:30 a.m.
Holy Wednesday, April 27th, Presanctified Liturgy 9:00 a.m., Confession 8:30 a.m.
Holy Thursday, April 28th, Divine Liturgy 9:00 a.m.
Matins & Reading of the 12 Passion Gospels 6:30 p.m.
& followed by Praises of Matins. Great and Holy Saturday, April 30th, Vesperal Divine Liturgy 9:00 a.m., General Confession 3:00 p.m.
A Warm Welcome to His Eminence, Archbishop Mark as we celebrate the Entrance of our Lord and Saviour Jesus Christ into Jerusalem. May Archbishop Mark be blessed with good health as he continues to provide spiritual leadership for our beloved Diocese of Eastern Pennsylvania. A Special Thank You: to Steve and Martha Myshak in donating the three remaining Stained Glass Windows on the first level of our Church Addition. Baut Studios has been commissioned to compete this project and the work will take 6-8 weeks to complete. May our Lord Jesus Christ continue to bless Steve and Martha Myshak for many blessed years of good health and salvation for this generous offering to our Church. Orthodox Easter Pascha orders: Holiday rolls, kielbasa, horseradish, etc. Thank you for your support! Pick-up Tuesday, April 26th at St. Michael’s Center. 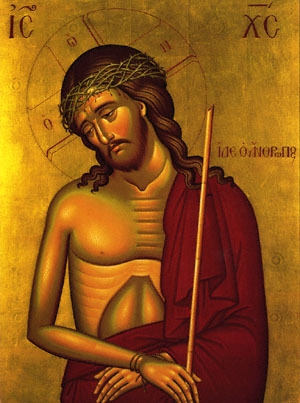 Diocesan Bridegroom Matins Service will be held this afternoon at 4:00 p.m. at the Holy Resurrection Orthodox Cathedral, in Wilkes-Barre, Pa. Archbishop Mark and the deanery clergy will be participating. Holy Wednesday, April 27th Healing Service will be held at St. George’s Orthodox Church, Keyser Ave., in Taylor, PA, at 6:00 p.m.
Special Donations : $100.00 offered by Dr. Joseph Danyo for the continued good health of his family, $50.00 in memory of Mary Joan, Anna & Samuel Rusiniak from the Lasichak Family, $20.00 for candles for the departed Franchak & Homish families offered by Katherine and Andrew Homish, $25.00 Easter Lily, offered by Fr. John and Matushka Kathy Kowalczyk, for the departed members of their family, $15.00 for Easter Lily for the health of Dorothy Allen and family: Baby Helena, Amy, Joe and children, $15.00 Easter Lily and $10.00 candles in loving memory of son Alan, offered by Peter & Helen Senio, $15.00 Lily & $10.00 candle in loving memory of Daniel P. and Mary Kitchura and Godchild: Barbara Kitchura. Easter lily and Candles Donations are being accepted. $15.00 small lily plant, $25.00 large lily plant and $10.00 for Easter Candles. You may offer the flowers and candles in loving memory of your departed family members or for the continued health of your family. We thank you in advance for your support. Hospitality a la Russe featuring Traditional Russian Cuisine, with the Kauriga Balalaika Orchestra, will be held on Sunday, May 15th at St. John’s Russian Orthodox Cathedral in Mayfield. 3:30 p.m. Reception & Russian Table, and Theme Basket Drawing. Please contact Kay Fedirko for the RSVP. Please remember in your prayers: Olga Sviatko and Michael Klaptach who are guests at the Wayne Woodlands Manor, in Waymart. Ann Butler is a guest at Elm Croft Mid-Valley, 89 Sturges Rd., Peckville, PA 18452, and Andrew Petrilak is a new guest at the Carbondale Nursing Home, 10 Hart Pl., Carbondale, PA 18407. Hostesses: Sunday, April 24th: Dorothy Allen, Debbie Bernosky, and Ann Butler. Sunday, May 1st: (Easter). 2 pm to 4 pm - John Pash, Sr., John Pash Jr. Note: Fr. Gabriel, Klapatch Brothers, & Joseph Krenitsky will remove some of the grave at 10 p.m. 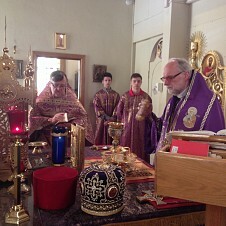 The carrying of the Cross, Gospel, Banners, Icon, Candles and Arthos will be selected from church attendees. Bells - George Petorak. The Blessing of Easter Baskets in the church basement following service. 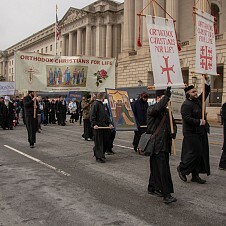 The carrying of the Cross, Gospel, Banners, Icon, Candles, and Arthos will be selected from church attendees. If you are unable fulfill your assignment, please call Joseph Krenitsky at 876-2770. The church will be closed Friday night at Midnight. Persons on guard from 10 pm to 12 am are responsible to make sure candles are extinguished and for locking the church. Also, persons on guard Saturday morning from 6 a.m. to 8 a.m. are to open the church and light the candles. All keys are to be returned to Joseph Krenitsky.